The zero standing accusingly beside Ireland's name until the very last play of the game summed up the display of a team with nothing to offer on the day. From the opening moment when Jacob Stockdale was trundled into touch to set up the position from which Hadleigh Parkes scored a try after 70 seconds there was only ever going to be one winner. The end of an era feel to it all evoked memories of similar displays in the dying days of the Eddie O'Sullivan and Declan Kidney reigns. Joe Schmidt's time with Ireland is up too though the team will hobble on to the World Cup. Those inclined to do so will hype up that tournament and pretend a couple of comprehensive wins over weak opposition in the group stages portend a recovery. But a team which loses by 12 points to England and by 18 points to Wales, scorelines which hugely flatter Ireland, who scored seven points in the final seconds of both matches, can't be considered as a contender for World Cup honours. What a difference a year makes. This time 12 months ago Ireland went to Twickenham and played perfect rugby to amass a 16-point half-time lead which more or less guaranteed the Grand Slam. Yesterday it was Wales who led by 16 at the break and put the game to bed long before the final whistle. Jordan Larmour's try now, like Johnny May's last-gasp try then, seemed as much an admission of impotence as a gesture of defiance. It has been a catastrophic Six Nations campaign. There was too much eagerness to excuse defeat by England on the grounds of Ireland being caught on the hop and to discern signs of steady improvement in victories over weaker opposition. Such delusions of progress were comprehensively scotched in Cardiff. The idea that Ireland's half-back pairing were on the verge of rediscovering their mojo was revealed as wishful thinking in excelsis. Conor Murray was again a listless and uncertain figure, one spectacularly ill-judged box kick out on the full symbolising his Six Nations form. Johnny Sexton's performance suggested that he made a Faustian bargain to secure the World Player of the Year award and that Satan fancied calling in payment yesterday. The out-half put a kick-off dead, rooted an attempted up and under over the line, spilled the ball to Josh Adams, who nearly got in for a try, and flung a pass over the touchline with Ireland in a scoring position. 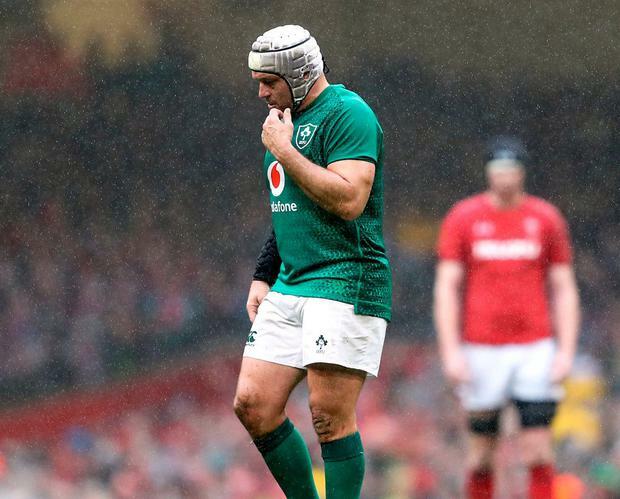 But Ireland were in disarray everywhere, troubled by an unsung Welsh scrum, losing a lineout on our own throw to a team who'd only managed one steal in their previous four games, bullied physically, out-thought tactically, clueless creatively. Nowhere did the visitors' bewilderment manifest itself more clearly than in the persistent concession of foolish penalties. By the 50th minute a side which had conceded just 19 penalties in its previous four matches had already given away ten. For the first time under Schmidt the team looked ragged and dispirited in the manner of sides who know the tide has turned against them for good. Forty-four years ago an Ireland team which had drawn with the All Blacks two years previously and won the Five Nations the following season came to Cardiff with high hopes and suffered a 32-4 loss. That reverse presaged the break-up of a fine side and a period in the wilderness. Yesterday's may be a similar landmark. How has it come to this for a team which less than six months ago toppled the All Blacks? In years to come as players retire and autobiographies are ghosted, explanations will no doubt be forthcoming. Till then we can only speculate. That something has gone badly wrong is beyond dispute. Fair play to the Welsh. The ability to sing loudly in unison may not be one of the world's great cultural achievements but it does lend great atmosphere to a rugby match. As they launched into their anthems, On The Banks Of My Own Lovely Leek and the like, it was hard to begrudge victory to a country where rugby really is the people's game. Kudos as well to Warren Gatland. It's customary among Irish alickadoos to belittle the man's managerial talents though he rescued our own team from the doldrums and earned the Lions a first Test series win in 16 years and an utterly unexpected tie with the All Blacks. Now here he is again, coaxing a Grand Slam out of a team drawn from provinces regularly swatted aside by Irish opposition. This is the third Grand Slam he's won with the principality. No other coach has achieved this hat-trick, yet in Ireland he has been perennially derided. We've also condescended to Wales, regarding them as beneath our contempt while our sights were set on surpassing England and the All Blacks. More fools us. Forget your World Cup fantasies. Turn Ireland over. We're done.